Home » How to Clean Up Drawing Files in AutoCAD? How to Clean Up Drawing Files in AutoCAD? Ever wonder why your Drawing file size is large when there are less/few visible objects inside it ? Sometimes we are unable to send such large files via email and due to file size limit in Company or by email Provider . Also to transfer Large files via FTP takes time & What if there are hundreds of such files ? Following Clean Up methods in AutoCAD will remove unused stuff , Reduce file Size and increase Performance . Purge Feature in AutoCAD is most useful feature to Clean Up Drawing Files. You can Remove Unused named items such as blocks, Layers, Linestyles , etc.. 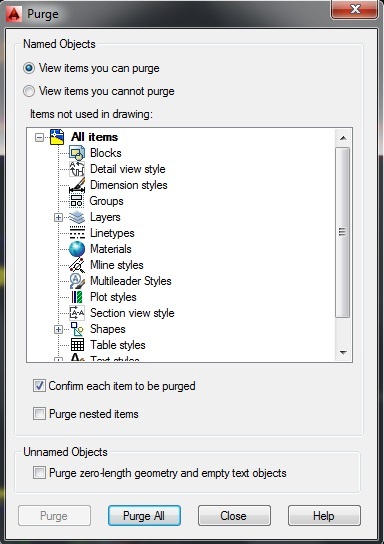 Here you can view list of items that you can and cannot purge in Specific Drawing File. You can select single or multiple items and click ‘Purge’ button on this dialog box or you Can click on ‘Purge All’ button to delete all items . You can view items you cannot purge by clicking on radio button ‘View items you cannot purge’ these entities as they are referenced or in use inside Drawing file. 1. ‘Confirm each item to be purged’ : This will pop up an confirmation pop up each time you will click on Purge or Purge all buttons to confirm before purging any itmes. 2. ‘Purge nested items’: If items such as blocks inside blocks are there then this option will delete objects and sub objects inside it . 3. Unanamed Objects- ‘Purge zero-length geometry and empty text objects’: This option will delete Some non block objects such as lines, arcs who have zero length & text and mtext are empty . Run Command: RECOVER/ RECOVERALL from command line. 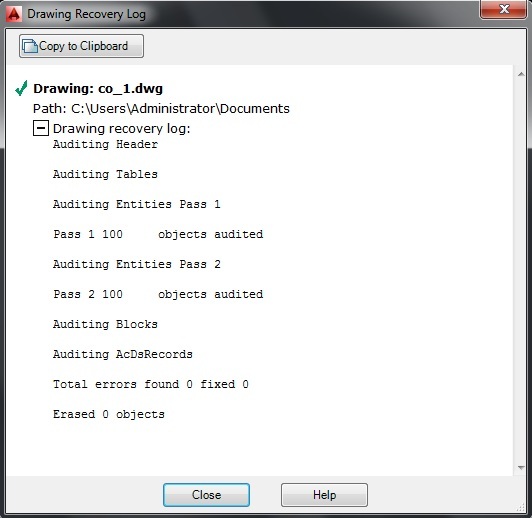 Recover command repairs and opens a damaged file. Recoverall command repairs damaged file along with all attached Xrefs. 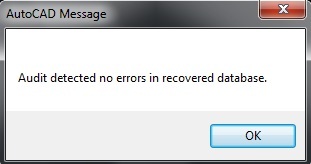 This will pop up dialog box to Select and open existing drawing file for recover. 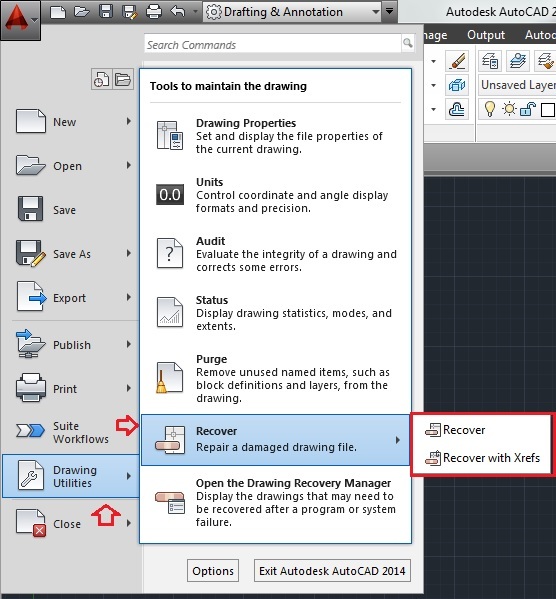 This dialog box will pop up automatically when AutoCAD will detect any damaged file. This command will evaluate the integrity of a drawing and correct some errors. You should run this command whenever you will experiencing difficulty in working with Drawing files or if files are Created in other than AutoCAD software. This Command is to clean up anything you wanted. Just select objects and Press Delete tab on Keyboard or Go to Modify Panel > click on ‘Erase’.